Blumberg, who’s also the co-founder of popular“Planet Money” podcast, brought the figures to back up his case, telling CNBC that more than 60 million people listen to podcasts. NPR, which hosts “Planet Money,” delivers podcasts to 12.3 million users each month, with the economy-focused program listed as the #6 ranked podcast byPodtrac. 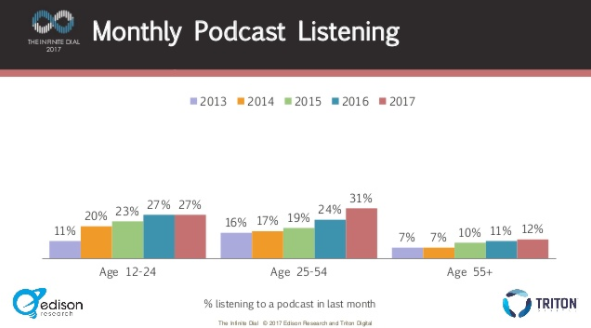 According to Edison Research’s “The Podcast Consumer 2017,” the number of podcast listeners is growing from 21 to 24 percent year-over-year and nearly a quarter (24 percent) of listeners subscribe to six or more podcasts. The barriers to launching a podcast program are low and relatively inexpensive, with a high-quality microphone and audio editing software as the key ingredients. When you add compelling content and keep each installment brief (According to Cision, users prefer podcasts that last less than 16 minutes) that often can be a recipe for success. But if your company can’t produce its own podcast, perhaps booking one of your executives as a guest might be a better fit. The growing number of series covering healthcare technology and innovation provides an opportunity to get your message heard by a demographic Blumberg calls “the unreachables” – “cable-cutters” and others not connected to conventional media. Podcasts can be an engaging and effective addition to your marketing communications strategy. Creating a podcast helps you connect with your audience and presents your company and its leadership as authorities in their field, something that often is more challenging to accomplish through the written word. Wayne Travers Jr. is an account director at KNB Communications. KNB is the communications marketing firm that speeds up success for health and health tech companies through an intelligence and data-driven process that enables companies to accelerate their growth. KNB offers a full spectrum of integrated communications marketing services, including public relations, marketing, branding, content marketing, mapping and digital capabilities to help clients compete and win in a highly competitive and evolving healthcare marketplace. An experienced and diverse team has serviced more than 150 healthcare organizations over the past 17 years, including top health tech companies, providers and payers, and supports companies at various points in their life cycle, from growth stage to Fortune 500. For additional information on how KNB can help companies of all sizes differentiate their business, communicate their value and accelerate their success, visit www.knbcomm.com.